Draft: 2009, Cincinnati Reds, 2nd rd. Billy R. Hamilton resides in Taylorsville, Miss. during the offseason...While at Taylorsville High School, was recruited to play wide receiver for Mississippi State University, but opted to sign with the Reds instead...Participated in 2019 RoyalsFan Fest. Appeared in a career-high 153 games with Cincinnati, batting .236/.299/.327 with 16 doubles, nine triples, four homers and a career high 46 walks…ranked second in the National League with 34 steals, the fifth-straight season he's finished second in the NL in thefts...A finalist for a Rawlings Gold Glove for a fifth-straight season (2014-18)...His nine triples ranked tied for second in the NL, trailing only Arizona's Ketel Marte (12)…his total was two shy of his career-best 2017 mark, while his 20 over the last two years are second-most in the Majors behind Charlie Blackmon (21)...Led the National League with 12 outfield assists, while his total tied for the Major League lead, matching Boston's Andrew Benintendi and Seattle's Mitch Haniger…he was one shy of his career-high total (13), set in 2017...Batted .306 (20-for-78) during the month of August, his highest average in a month since hitting .327 (36-for110) in June 2014 (min. 75 PA)...Recorded his 50th career multi-steal game on April 10 at Philadelphia, swiping second base twice…it was the first of seven multi-theft contests, recording three steals twice and two stolen bases five times...Collected his fourth career walk-off RBI on May 19 vs. the Cubs, drawing a bases loaded walk in the 11th inning off Justin Wilson in a 5-4 triumph...On May 26 at Coors Field, timed at 10.39 seconds from home plate to third base, the fastest triple in the Majors since Statcast started tracking this in 2015...Saw his first action in right field on July 8 at Wrigley Field…entered the game in the 10th inning after LF Adam Duvall moved to the infield and RF Scott Schebler moved to Duvall's vacated position...Set a career-high with two triples on Aug. 19 vs. San Francisco…he was one of just 11 players to collect two triples in a game during the 2018 season...Blasted his third career leadoff home run on Aug. 29 vs. Milwaukee, off Freddy Peralta…all three of his leadoff dingers have come against the Brewers, including June 27, 2017 off Junior Guerra (at Great American Ballpark) and June 15, 2014 off Marco Estrada (at Miller Park). Established new career highs in runs, hits, triples, walks and stolen bases...ranked among the National League leaders in triples (2nd), steals (2nd) and hardest to GIDP (116.4ab, 4th)...for the fourth consecutive season was a finalist for but did not win the Rawlings Gold Glove Award for CF...his 13 outfield assists were second in the Major Leagues to teammate Adam Duvall's 15 assists...per Statcast, his three 5-Star Catches ranked T10th among all players...from 5/3-8/20 produced a 93-game errorless streak..following the season was rated by field managers the fastest and best baserunner in the National League...per Statcast, his home-to-second-on-a-double time of 7.19 seconds on 5/6 vs SF was the fastest of any player all season in that category...with 59 stolen bases ranked second in the Major Leagues (Mia's Dee Gordon, 60sb)...was trying to become the first Reds player to lead the National League since Bobby Tolan in 1970...Bob Bescher (1909-1912) and Lonny Frey (1940) are the only other Reds players to lead the league in steals...his chase for the stolen base crown was hampered in September, when from 9/7-9/21 he missed 13 games with a fractured left thumb suffered on a bunt attempt in the first inning of the 7-1 win on 9/6 vs Mil...when he broke his thumb led the Major Leagues with 58 stolen bases...Mia's Dee Gordon had 49 steals at the time of Hamilton's injury, 55 steals when Hamilton came off the disabled list and then took over the lead in the second-to-last game of the season with his 59th and 60th stolen bases...in each of the 2015 and 2016 seasons Hamilton was leading the Major Leagues in stolen bases when he suffered season-ending injuries in September, finishing second in the majors each year...stole 2 bases in a game 9 times and a season-high 3 bases in a game 3 more times...since his debut on 9/3/13 leads all Major League players in stolen bases with 243, sixth on the Reds' all-time list since 1898...Reds Hall of Famer Eric Davis is fifth at 270...in the first inning, with 32 runs scored tied Col's Charlie Blackmon for second in the Major Leagues to Mia's Dee Gordon (37) and led the majors with 24 stolen bases while hitting .307 with a .348 on-base percentage...ranked second on the club with 37 multi-hit games (Joey Votto, 51 multi-hit games)...from 4/26-5/30 reached base safely via hit, walk or HBP in 28 of his 29 apps (37-127, .291, 4 2b, 3 3b, 1hr, 14rbi, 18sb, .343obp), including a career-high streak of 23 consecutive games reaching safely from 4/26-5/23...his career-high 11 triples were the most by a Reds batter since Mariano Duncan had 11 in 1990...hit .259 vs RHP and .219 vs LHP...in the bottom of the 10th inning of the 4-3 win vs Pit on 5/1 produced his second career walkoff hit, an RBI-double of Daniel Hudson...his 3-run HR off Pit's Jameson Taillon in the 7-2 win on 5/3 snapped his homerless streak at 319 at bats dating back to a solo HR off Chi's Jon Lester on 6/28/16...when snapped was the third-longest active streak in the Major Leagues (Tex' Pete Kozma, 536ab; Mia's Adeiny Hechavarria, 407ab)...in the fifth inning of the 4-2 win on 5/4 vs Pit produced his 200th career stolen base in his 424th appearance, the fourth-fewest number of games to reach 200 steals by any Major League player since 1900 (Vince Coleman 280, Tim Raines 361, Rickey Henderson 366)...from 4/30-5/11 scored at least 1 run in 11 consecutive apps...was the longest streak by a Reds batter since Bip Roberts scored a run in 11 consecutive apps in 1992 and the longest in the Major Leagues since Adrian Beltre of the Rangers scored a run in 12 straight games from 8/25-9/6, 2016...in the 13-3 win on 5/5 vs SF, became the first Reds player to produce in a game 3 hits, 1 triple, 2 RBI, 2 walks, 4 runs and 2 steals (since RBI became a statistic in 1920)...was the first Major Leaguer to do it since Bos' John Valentin on 6/13/1995 at Tor...on 5/5 and 5/6 vs SF went 6-for-10 (1 2b, 2 3b, 4rbi, 2bb, 3sb, 6r)...became only the third Reds player since 1900 to record 3 stolen bases and 6 runs scored over 2 games (Joe Morgan in 1976, Miller Huggins in 1905)...from 5/5-5/7 vs SF tripled in 3 straight apps, the first Reds batter with triples in 3 consecutive games since Deion Sanders did it from 4/23-4/26, 1997...no Reds batter ever has tripled in 4 straight apps...hit his 4 home runs on 5/3 vs Pit off Jameson Taillon, 6/27 vs Mil off Junior Guerra, 8/1 at Pit off Taillon and 9/4 vs Mil off Josh Hader...the homer off Guerra was the second leadoff HR of his career...the solo HR off Hader in the 5-4 win was the first walkoff HR of his career and third career walkoff hit...on 8/3 at Pit was ejected by HP umpire Todd Tichenor for arguing balls the strikes, the first of his career. Missed the last 27 games of the season because of a strained left oblique suffered in his last appearance, on 9/4 vs StL...on 9/16 went on the 15-day disabled list...for the third straight season was a finalist for the Rawlings Gold Glove Award...among the National League leaders ranked second in stolen bases, T2nd in sacrifice bunts (11) and T7th in outfield assists (9)...among all center fielders ranked 13th in the Major Leagues and seventh in the NL in putouts...ranked fifth in the majors and third in the NL in assists by CF...in 45 apps after the All-Star break hit .293 (36sb, .369obp)...hit .333 in the first inning (.413obp) and .299 leading off any inning (.352obp)...for the second straight season was leading the Major Leagues in stolen bases when he suffered a season-ending injury...no Reds player has led the National League in stolen bases since Bobby Tolan had 57 steals in 1970...through his last appearance of the season led the Major Leagues with a career-high 58 steals (58-66, 88%), 7 more than Mil's Jonathan Villar...finished the season ranked second in the majors behind Villar (62-80, 78%), who on 9/24 vs the Reds took over the lead with his 59th SB...his 14 multi-steal games were a single-season career high and the most by a Reds player since Eric Davis produced a modern franchise record 20 multi-steal games in 1986...stole 2 bases in a game 7 times, stole 3 bases in a game 6 times and recorded a season-high 4 stolen bases on 8/7 at Pit...from 8/7-8/9 recorded at least 2 stolen bases in 3 straight apps, tying the modern franchise record for consecutive games with more than 1 steal shared by Deion Sanders (1995), Hans Lobert (1908) and Jake Beckley (1903)...on 5/1 at Pit made his first career start batting second in the order...on 7/17 vs Mil recorded his 150th career stolen base in his 356th game. Was a finalist for the Rawlings Gold Glove Award...established club records for fewest errors (0) and highest fielding percentage by an outfielder (100%, 281tc, 8 assists)...led National League outfielders in fielding percentage and tied LAA's Mike Trout and NYY's Jacoby Ellsbury for the Major League lead in fielding percentage by a center fielder... was voted by managers the third-best defensive outfielder in the NL...led the club in sacrifice bunts (9)...hit .241 batting righthanded and .220 batting lefthanded...on 9/29 had season-ending arthroscopic surgery to repair the torn posterior labrum and to debride fraying in his right shoulder...was disabled with the shoulder injury twice, from 8/19-9/7 and from 9/24 through the end of the season...suffered the injury vs KC on 8/18 while diving for a ball and then over 6 starts between stints on the DL aggravated the injury while making throws from the outfield...made his last start of the season on 9/14 at SF and his last appearance on 9/16 as a pinch runner...through his last appearance led the Major Leagues with a career-high 57 stolen bases (57-65, 88%), 6 more than Mia's Dee Gordon...finished the season ranked second in the majors in steals behind Gordon (58-78, 74%), who on the second-to-last day of the season took over the lead with his 58th and final stolen base...at the time of his surgery was on pace to become the fourth Reds player to lead the National League in stolen bases, the first since Bobby Tolan had 57 steals in 1970 (also, Bob Bescher & Lonny Frey)... Hamilton's 44 stolen bases prior to the All-Star break were the most ever by a Red...became the first Reds batter with at least 1 stolen base in each of his first 4 apps of a season since Hall of Famer Barry Larkin began the 1988 season with a steal in each of his first 6g (7sb)...in the 11-inning, 2-1 loss on 6/14 at Chi tied the club record with 5 stolen bases (Ryan Freel, 7/27/05 at LAD)...his fifth steal was the 100th of his career in his 219th appearance, the fastest to that mark since Vince Coleman swiped his 100th career base in his 135th career game in 1985...his 19 stolen bases in June were the most by a Red in any calendar month since Deion Sanders had 19 steals in April 1997...also in June became the first player with a pair of 4-steal games in a calendar month (5sb on 6/14 at Cubs, 4sb on 6/29 vs Min) since NYY's Tony Womack and WSox' Scott Podsednik did it in May 2005...now has 3 career apps with at least 4 stolen bases (4sb on 9/8/13 at Hou, 4sb on 6/29/15 vs Min, 5sb on 6/14/15 at Chi), joining Ichiro Suzuki (Sea 2, NYY 1) as the only Major Leaguers active in 2015 with as many as 3 career apps of at least 4 steals...on 5/17 vs SF batted eighth for the first time in his career...prior to 5/17 made 171 of his 172 career starts batting leadoff...from 5/17 until he was injured on 8/18 made 58 of his 70 starts batting ninth in the order but, after coming off the disabled list, from 9/9-9/14 led off in 5 of his 6 starts...beginning 5/17 also batted leadoff 7 times, seventh in the order once (7/22/day vs Cubs) and eighth 4 times...on 6/2 at Phi produced a suicide squeeze bunt that scored Zack Cozart. After making his first Opening Day roster finished second in the Baseball Writers' Association of America's National League Rookie of the Year Award voting...also was a finalist for both the Players Choice Award as the NL's Outstanding Rookie and the Rawlings Gold Glove Award...was rated by managers the best and fastest baserunner in the NL...became 1 of only 5 Major League rookies since 1900 ever to produce at least 141 hits, 25 doubles, 8 triples, 72 runs and 56 stolen bases in a season (Ichiro Suzuki 2001, Tony Womack 1997, Juan Samuel 1984, Benny Kauff 1914)...led National League rookies in RBI, multi-hit games, runs, hits, total bases, doubles, stolen bases and extra-base hits...overall ranked among the NL rookie leaders in 15 statistical categories...among all NL players ranked second in steals while leading all NL center fielders in assists (10) and fielding percentage (.994)...his 152 apps were the most by a Reds rookie since Johnny Bench appeared in 154g in 1988...led the team in triples and stolen bases and tied for the club lead in doubles...his 56 steals were a single-season franchise record for a rookie, the most by a Major League rookie since Ichiro Suzuki had 56 in 2001 and the most by any Reds batter since Deion Sanders had 56 in 1997...Bob Bescher held the club rookie steals record since 1909 (54) and still holds the Reds' all-time record for stolen bases in a season (81, 1911)...was NL Rookie of the Month for June (27g, .327, 3hr, 18rbi, 14sb, 18r)...grounded into just 1 double play, a club record for batters with 150 apps or more (2, Drew Stubbs, 2011)...made all 136 of his starts batting leadoff and playing CF...missed the last 4g of the season with a concussion suffered while making a catch over the outfield wall on 9/24 vs Mil...beginning 4/15, after a 6-for-43 start, hit .260 the rest of the season...hit .246 vs RHP (5hr) and .264 vs LHP (1hr)...his 38 stolen bases were the most ever by a Reds rookie prior to the All-Star Game, the most by any Reds player prior to the ASG since Deion Sanders had 41 steals in 1997 and most by any rookie at the ASG break since 1986 (John Cangelosi, 39sb)...on 6/17 at Pit produced his second career 3 hit/3 stolen base game to become the first rookie in Reds history with 2 such games (also, 9/18/13 at Hou)...Chris Sabo (1988) and Hughie Critz (1924) were the only other Reds rookies with 3 hits and 3 steals in a game...over the last 2 seasons, Sea's James Jones is the only other rookie to produce 3 hits and 3 stolen bases in a game...from 6/10-6/24 hit .375 (2hr, 11rbi, 6sb) during a career-high 12-game hitting streak, the third-longest by a rookie in the National League in 2014...when snapped was the longest active streak in the National League and the second-longest active streak in the Major Leagues...in the fifth inning of the 3-2 win on 4/29 vs Cubs hit his first career HR (solo off Jeff Samardzija) to tie the game at 2-2...from 5/2-5/10 missed 7 starts with sprained knuckles on his left hand, injuries suffered on 5/1 vs Mil while making a diving catch...in the 15-inning, 4-3 win on 5/19 at Wsh made a game-saving catch on Anthony Rendon's line drive with 2 outs in the bottom of the 14th, stranding the winning run on third base...on 6/14 and 6/15 at Mil homered in consecutive plate apps off Will Smith and Marco Estrada...the homer off Estrada was his first career leadoff HR and the only leadoff HR hit by the Reds all season...on 6/24 at Cubs, led off the seventh inning with a single to break up Jake Arrieta's perfect game and extend his career-high hitting streak to 12g...in the nightcap on 7/8 vs Cubs produced his first career walkoff hit, an RBI-single off Hector Rondon for a 6-5 win...in the 12-inning, 3-1 loss on 8/22 vs Atl had both Reds hits, including an RBI-single with 2 outs in the eighth inning that broke up Mike Minor's no-hit bid...on 8/27 vs Cubs became the ninth player in club history to produce 50 steals in a season...on 8/31 at Pit recorded his 54th stolen base, tying Bescher's club record for steals in a season by a rookie...broke the mark with his 55th steal in the next game, on 9/2 at Bal...from 9/3-9/13 did not record a stolen base over 11 apps, his longest drought of the season...earned his spot on the Opening Day roster after hitting safely in 12 of his 18 spring training apps, reaching base safely via hit or walk in 15 of his 18g and leading the club in runs (14) and stolen bases (9)...in March went 9-for-9 in stolen base attempts and in the same inning 3 times stole second and then third...entered the season rated the second-best prospect in the organization, behind only RHP Robert Stephenson, and the fastest baserunner and best athlete. The organization's top prospect spent most of the season at Louisville but made 13 apps and 3 starts for the Reds as a September callup...in his Major League debut hit .368 with 13 stolen bases in 14 attempts...was on the Reds' Wild Card playoff roster but did not appear in the 6-2 loss at Pit...after his promotion on 9/2 led the Major Leagues in steals (13-for-14, Eric Young Jr. 2nd with 12sb)...on 9/25 vs NYM was caught stealing for the first time, in his 14th attempt (P Daisuke Matsuzaka, C Juan Centeno)...became the first Reds player to begin his career with at least 13 consecutive successful stolen base attempts since Barry Larkin went 15-for-15 over the 1986-87 seasons...entered 7g as a pinch runner...scored 2 game-winning runs (9/3 vs StL, 9/7 vs LAD), a game-tying run (9/20 at Pit) and an extra-inning go-ahead run (9/18 at Hou)...is the only player in modern Major League history to record a stolen base in each of his first 4 career apps...NYY's Fritz Maisel (1913), StL's Ray Lankford (1990) and NYM's Pat Howell (1992) each had a steal in their first 3 apps...Hamilton also is the only player in the live ball era to record 2 stolen bases and 2 runs scored in his first 2 career apps without recording a plate appearance...made his Major League debut on 9/3 vs StL, pinch ran in the seventh inning and scored the game's only run on Todd Frazier's double...in his second appearance, on 9/4 vs StL pinch ran in the 14th inning, stole second off RHP Edward Mujica and C Yadier Molina and scored the tying run in the 16-inning, 5-4 loss...hit safely in all 3 of his starts (7-14, .500, 2 2b, 1rbi, 6sb, 4r)...in the 13-inning, 6-5 win on 9/18 at Hou made his first career start, played CF and batted ninth (3-4, 1 2b, 1rbi, 2bb, 4sb, 2r)...produced the first hits and RBI of his career and his first multi-steal game...is the only player in the live ball era (since 1920) to have 4 stolen bases in his first career start...became the first Reds baserunner with 4 steals in a game since Felipe Lopez had 4 on 5/10/06 vs Wsh...fell 1 shy of Ryan Freel's single-game club record (5sb, 7/27/05 at LAD)...became only the second Red and eighth player in Major League history to reach base safely 5 times in his first career start, accomplished most recently by teammate Jay Bruce on 5/27/08 vs Pit...in his first plate appearance of his first start doubled off RHP Brad Peacock and scored on Shin-Soo Choo's single...was 1 of 7 Reds players to make Major League debuts (OF Derrick Robinson, RHP Justin Freeman, OF Donald Lutz, IF Neftali Soto, RHP Curtis Partch, RHP Nick Christiani)...on 9/2 was promoted from Louisville, where he was an International League All-Star in voting of general managers, managers, coaches, broadcasters and beat writers...also was named by managers as the fastest baserunner, best baserunner and most exciting player in the IL...led the organization and all Class AAA batters with 75 stolen bases, the IL's highest total since Otis Nixon of Columbus had a league-record 94 steals in 1983...ranked second overall in the minors behind Class AA Birmingham's Micah Johnson, who had 84 stolen bases...ranked third in the IL in runs scored (75)...hit a pair of leadoff HR (5/10 vs Buffalo, 6/16 at Norfolk) and an inside-the-park HR (6/3 at Toledo)...participated in the Sirius XM All-Star Futures Game at NY's Citi Field and the Triple-A All-Star Game in Reno...entered the season rated by Baseball America the best prospect, fastest baserunner and best athlete in the organization...played for Santurce in the Puerto Rican Winter League (17g, .227, 3 2b, 1 3b, 4rbi, 11sb, 2cs)...was invited to 2013 Major League spring training camp, his first...played outfield for the first time in his professional career. For the second straight season received the Sheldon "Chief" Bender Award as the organization's Minor League Player of the Year...established a professional baseball record with 155 stolen bases in 192 attempts (81%)...led both the California League and Southern League in stolen bases and ranked fifth in the CL in hitting (.323)...was the California League's Most Valuable Player, a Baseball America Minor League All-Star, a Southern League All-Star, a Topps Class A All-Star and Baseball Digest's Minor League Player of the Year...among all Class A hitters ranked seventh in on-base percentage (.413) and ninth in hitting (.323)...in Baseball America's 2012 "best tools" issue was selected by managers as the fastest baserunner, best baserunner and most exciting player in both the Southern League and California League...participated in the Sirius XM All-Star Futures Game in Kansas City...among all Reds minor league players ranked fourth in hitting (.311)...was the organization's Player of the Month for April (23g, .398, 29sb)...on an inside-the-park HR on 7/15 vs Jacksonville reportedly rounded the bases in 13.8 seconds, which according to Baseball Prospectus may have been the fastest time on record...on 8/21 vs Montgomery broke Vince Coleman's steals record (145sb in 1983 for Macon)...recorded that record-setting 146th stolen base on a steal of third off pitcher Kyle Lobstein...following the season played for the Arizona Fall League champion Peoria Javelinas (17g, .234, 1 2b, 1 3b, 1hr, 9rbi, 10sb, 2cs)...was selected to participate in the AFL's Rising Stars Game and was named to the league's Top Prospects Team. Received the Sheldon "Chief" Bender Award as the organization's Minor League Player of the Year...was a Midwest League All-Star...led all minor leaguers with 103 stolen bases...became the first player to steal 100 bases in a minor league season since 2001, when Peoria's Chris Morris set the Midwest League record with 111...shattered the Reds organizational record for stolen bases in a season held by Ramon Sambo (98, 1988)...led all Midwest League players in steals, runs (99), at bats (550) and games (135, T1st)...appeared in 132g at SS, 2g at DH and 1g as a pinch runner. At Rookie Billings was a Pioneer League, Baseball America Rookie All-Star and Topps Short-Season/Rookie All-Star...ranked among the Pioneer League leaders in steals (1st), triples (1st, 10), runs (T4, 61) and hits (5th, 90)...led all Reds farmhands in steals and ranked second with a .318ba...on 9/6 vs Missoula recorded 5 stolen bases...appeared in 55g at 2B and 13g at SS. In his first professional season batted .209 with 14 stolen bases in 42 games with the Rookie GCL Reds. December 11, 2018 Kansas City Royals signed free agent CF Billy Hamilton. 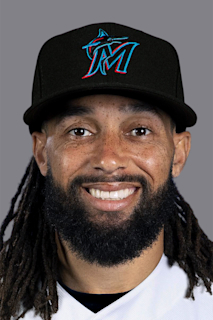 November 30, 2018 CF Billy Hamilton elected free agency. September 20, 2017 Cincinnati Reds activated CF Billy Hamilton from the 10-day disabled list. September 7, 2017 Cincinnati Reds placed CF Billy Hamilton on the 10-day disabled list. Left thumb fracture. October 3, 2016 Cincinnati Reds activated CF Billy Hamilton from the 15-day disabled list. September 15, 2016 Cincinnati Reds placed CF Billy Hamilton on the 15-day disabled list retroactive to September 5, 2016. Oblique. June 17, 2016 Cincinnati Reds activated CF Billy Hamilton from the 7-day disabled list. June 10, 2016 Cincinnati Reds placed CF Billy Hamilton on the 7-day disabled list retroactive to June 9, 2016. Concussion. May 16, 2016 Cincinnati Reds activated CF Billy Hamilton from the bereavement list. May 13, 2016 Cincinnati Reds placed CF Billy Hamilton on the bereavement list. October 5, 2015 Cincinnati Reds activated CF Billy Hamilton from the 15-day disabled list. September 8, 2015 Cincinnati Reds activated CF Billy Hamilton from the 15-day disabled list. September 5, 2015 Cincinnati Reds sent CF Billy Hamilton on a rehab assignment to Pensacola Blue Wahoos. August 19, 2015 Cincinnati Reds placed CF Billy Hamilton on the 15-day disabled list. Sprained capsule in right shoulder. October 31, 2013 OF Billy Hamilton assigned to Cangrejeros de Santurce. September 2, 2013 Cincinnati Reds selected the contract of CF Billy Hamilton from Louisville Bats. January 24, 2013 Billy Hamilton assigned to Louisville Bats from Pensacola Blue Wahoos. January 14, 2013 Cincinnati Reds invited non-roster CF Billy Hamilton to spring training. July 11, 2012 Billy Hamilton assigned to Pensacola Blue Wahoos from Bakersfield Blaze. July 7, 2012 Billy Hamilton roster status changed by Bakersfield Blaze. May 7, 2012 Bakersfield Blaze activated SS Billy Hamilton from the temporarily inactive list. May 4, 2012 Bakersfield Blaze placed SS Billy Hamilton on the temporarily inactive list. April 1, 2012 SS Billy Hamilton assigned to Bakersfield Blaze from Dayton Dragons. March 24, 2012 SS Billy Hamilton assigned to Cincinnati Reds. November 4, 2011 SS Billy Hamilton assigned to Leones de Ponce. April 4, 2011 Billy Hamilton assigned to Dayton Dragons from Billings Mustangs. March 1, 2011 SS Billy Hamilton assigned to Cincinnati Reds. June 23, 2009 SS Billy Hamilton assigned to GCL Reds from Cincinnati Reds. June 21, 2009 Cincinnati Reds signed Billy Hamilton.